it's all like a weird dream innit? Ravens are kept at the tower of London. 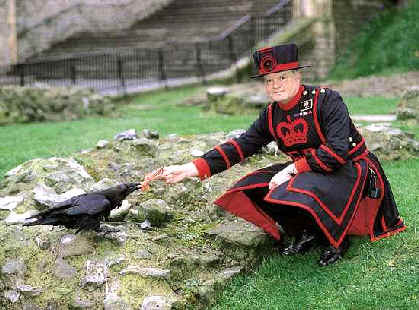 One of the Beefeaters cares for them. Beefeaters are guards who wear a kind of kilt with pants as well as an odd top hat. This reminds me of our American tradition where we have rabid badgers guarding the top of the statue of liberty who are tended by former NFL football champions. Oh wait. No we don’t.